Art Outreach Gallery: NEW GALLERY LOCATION! NEW GALLERY LOCATION! NEW GALLERY LOCATION! NEW GALLERY LOCATION! NEW GALLERY LOCATION! NEW GALLERY LOCATION! The Art Outreach Gallery has MOVED! Hope to see you at our NEW Eastwood Mall SPACE! Visit us at our NEW LOCATION near JCPenney between GNC and The Picture People. SPECIAL NOTICE to all Art Outreach Gallery 2015 Summer Workshoppers: All classes previously scheduled to meet at our former Store 220 location (near Sears) will be held at our NEW Store 904 LOCATION. 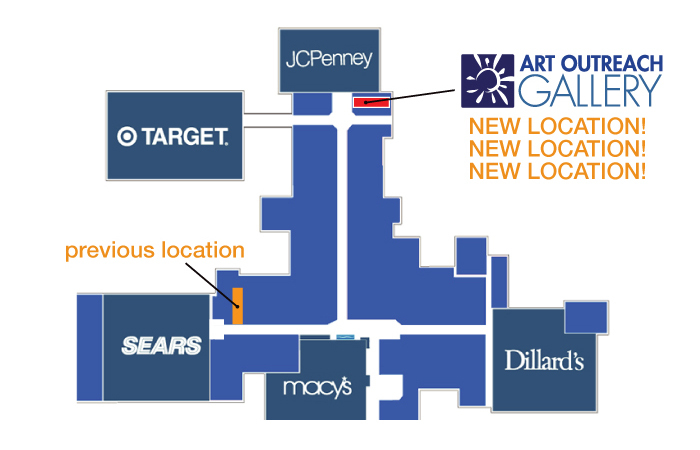 Again, we're now near JCPenney and between the GNC nutrition store and The Picture People photography studio. See you all there!